Larry J. Sabato's Crystal Ball » Venus vs. Mars: A Record-Setting Gender Gap? Venus vs. Mars: A Record-Setting Gender Gap? With four months to go in the 2016 general election campaign, national polls suggest that it’s quite possible that the Hillary Clinton-Donald Trump clash may well set a new record for partisan differences between the sexes. 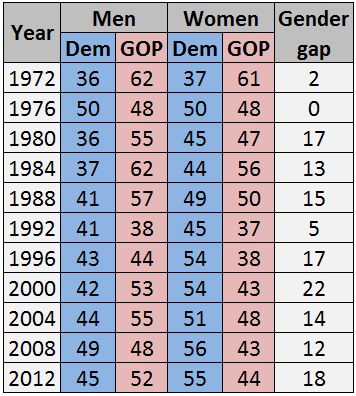 Since Clinton effectively sewed up the Democratic nomination on June 7, the average gender gap in 22 national polls is 24.4 points and the median gap is 26 points, slightly ahead of the exit poll era record set in 2000, as shown in Table 1 below. This sample only included poll results for questions asking respondents about just Clinton and Trump, thus excluding those that asked the horse race question with Libertarian Gary Johnson and/or presumptive Green Party nominee Jill Stein included. This choice largely reflects the fact that early polls tend to overstate the performance of third-party or independent candidates, which in turn affects the major party candidates’ totals. Notes: *Mean gender gap in 22 national surveys taken since June 7 based on responses to head-to-head Clinton-versus-Trump questions. Polls from the following are included: ABC News/Washington Post, American Research Group, CBS News, CNBC, CNN/ORC, Fox News, IBD/TIPP, Monmouth University, Morning Consult, NBC News/SurveyMonkey, NBC News/Wall Street Journal, Public Policy Polling, Quinnipiac University, Rasmussen Reports, and USA Today/Suffolk University. Special thanks to CNBC, Rasmussen, and SurveyMonkey for responding to requests for crosstab data. Other national polls taken since June 7 are not included due to lack of gender crosstab data or because they did not include a Clinton-versus-Trump head-to-head question (i.e. the horse race questions named Johnson and/or Stein in the question). Overall, 16 of the 22 surveys found the gap to be 20 or more points, which is notable simply because the 2000 election was the only cycle where the national exit poll found at least a 20-point gap. On the low end, a June 15-20 Morning Consult poll found the divide at just eight points. In fact, Morning Consult’s polls have routinely found a noticeably smaller gender gap than other pollsters, releasing four of the six post-June 7 polls with a gender gap smaller than 20 points. On the high end, a June 17-20 American Research Group survey showed a 44-point gap in gender voting intentions. The ARG poll tied for the largest lead for Trump among men in any poll (14 points) and it had the largest lead for Clinton among women (30 points), thus the huge (and likely exaggerated) chasm. This large disparity in gender gaps is just one more reason to look at polling averages and medians rather than one poll at a time. The gender gap has long been an electoral reality in American politics, whether in presidential races or down-ballot. In most elections, men tend to vote more Republican and women tend to vote more Democratic. Based on the national exit polls, there has been a notable divide in how men and women vote in every presidential election going back to 1980, when Ronald Reagan helped convert a significant segment of men, but not women, to the Republican Party. 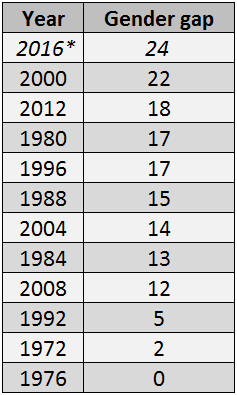 In fact, outside of 1992, every contest since 1980 has featured a gap of at least 10 percentage points. The all-time record in the exit poll era (1972-present) is 22 points, observed in the 2000 election cycle, when Al Gore won women by 11 points and George W. Bush won men by 11 points. Table 2 below shows partisan gender voting data in the exit poll era. There are always questions about what causes the gender gap. Fundamentally, ideological and policy differences explain it to some degree, with women generally favoring more government intervention in areas such as health care. For instance, an April poll by Pew found that more women (41%) than men (36%) thought the Affordable Care Act has had a “mostly positive” effect on the country. Women also tend to favor more liberal immigration policies. A June The Economist/YouGov survey showed that 49% of women believed that illegal immigrants should be allowed to stay in the county and eventually apply for citizenship, versus just 41% of men. These are just two examples of issue areas where women and men demonstrate notable differences in their views. But these existing divides appear to be exacerbated by the two major-party standard bearers in 2016. Clinton is the first woman to win a major-party nomination, and given the power of identity politics, it’s not hard to imagine her winning over at least some women because of that status. At the same time, she’s had trouble with male voters, even in the Democratic primary: In the 27 states with entrance or exit polling for primaries and caucuses, Clinton did worse among men than women in every single Democratic contest versus Bernie Sanders, with a median performance of 11 points worse. Meanwhile, Trump has a history of misogynistic remarks that hurts him with women voters. And his appeal to blue-collar white voters may particularly boost him among men but at the expense of women in that racial demographic: The most recent Quinnipiac poll showed Trump winning handily among white men but actually trailing among white women. The only Republican in the exit poll era to lose among white women was Bob Dole in 1996, when he faced Bill Clinton. All in all, we could see the largest gender gap in the modern history of U.S. presidential elections in November. Should that happen, never before will Venus have been quite so far away from Mars.